Presented by Red Brand Fence. Mike Penna and Jude Feld broadcast live from our Jimmy John's of Lexington studio. Special guests include Trainer Mark Casse, Don Little Jr., owner of Centennial Farm, Doug Arnold from Buck Pond Farm, and Fletcher Mauk, our Industry Star of the Week brought to you by Stuart Morris. Plus and interview with Hall of Fame Jockey, Kent Desormeaux. Mike Penna and Jude Feld broadcast from our Jimmy John's of Lexington studio. Special guests include Trainer Chip Woolley, WinStar President & CEO Elliott Walden, Trainer Brendan Walsh, and Frank Hopf, Senior Director of Racing Operations at Sam Houston Race Track. Mike Penna and Jude Feld broadcast live from our Jimmy John's of Lexington studio. Special guests include Darren Rogers, Churchill Downs Sr. VP of Communications, Dermot Carty and Ken Wilkins preview the Adena Springs stallion roster in our Stallion Spotlight presented by Red Brand Fence, Newly crowned Ms Connecticut USA and HRRN analyst Acacia Courtney, and Joe Harper Harper, CEO of the Del Mar Thoroughbred Club. Mike Penna and Jude Feld broadcast live from the Jimmy John's of Lexington studio. 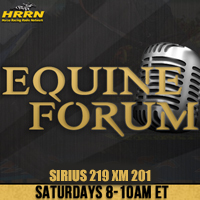 Special guests include Hall of Fame trainer Shug McGaughey, Terry Finley from West Point Thoroughbreds, Tim Layden from Sports Illustrated, and Trainer Simon Callaghan. Plus, an interview with Bob Baffert, and our Stallion Spotlight presented by Red Brand Fence with Gainesway's Michael Hernon and our Industry Star of the Week presented by Stuart Morris. Anthony and Jude Feld broadcast live from our Jimmy John's of Lexington studio. Special guests include Trainer John Servis, track announcer, Larry Collmus, Brien Bouyea from the National Museum of Racing and Hall of Fame, Headley Bell from Mill Ridge, and Santa Anita track announcer Frank Mirahmadi, our Industry Star of the Week pres. by Stuart Morris. Mike Penna and Jude Feld broadcast from our Jimmy John's of Lexington Studio. Special guests include Jockey David Cohen, Erich Zimny, VP of Racing & Sports Operations at Hollywood Casino at Charles Town Races, Sean Beirne, Director of the University of Louisville Equine Industry Program, Clifford Barry from Pin Oak Stud previews their stallions for the upcoming breeding season in our "Stallion Spotlight" segment presented by Red Brand Fence. Mike Penna and Jude Feld broadcast from our Jimmy John's of Lexington studio. Special guests include Mike Connolly, co-owner of Madison County Thoroughbreds, Jockey Frankie Pennington, Mike DeAnzeris, owner of EMBRACE THE RACE, Hall of Fame jockey John Velazquez, and Darley Sales Manager, Darren Fox, talks about the 2019 Darley stallion roster in our new "Stallion Spotlight" segment presented by Red Brand Fence. Jude Feld and Mark Otto of Red Brand Fence broadcast live from Gulfstream Park and look forward to the 2018 Claiming Crown. Special guests include Gulfstream General Manager Bill Badgett,, President & Chairman of National HBPA Leroy Gessmann, and a special interview with jockey Gary Stevens.